Do heavy weights make you “bulk up” ? | Fit and Fab Life! Do heavy weights make you “bulk up” ? GOOD GRAVEY NO! ..sorry I get this question probably once a week. Lets say it again, Lifting weights WILL NOT make you look like a man. Alright, hopefully I got my point across. Now, let me explain why. First off women don’t have as much testosterone as women, hence why when they workout and lift weights you see their progress much faster than women’s. For a woman to “bulk up” she would probably have to workout for endless hours (an amount that isn’t ideal to be doing in the first place), have a dramatic change in diet, probably be taking a testosterone booster and it takes YEARS to build that kind of muscle alone .. much less for a girl. Genetics also play a role in this as well. . . so if you start lifting and you think your getting “too big” .. then cool it on the weights , but seriously do not worry about it until you get there ok… quit using it as an excuse lol. 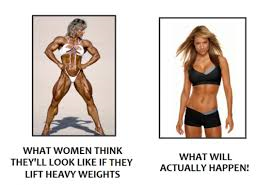 So what happens when a woman lifts heavy weights then? Well yes, you get that toned look that so many women strive to have but yet still worry about looking “like a man” … so quit your belly aching and start lifting heavy! You shouldn’t be lifting anything more that you cant lift either, your last reps should be hard but not too hard that you almost break an arm or leg =) Maintain your form to ensure you wont get injured. This entry was posted in abs, achive, achivment, arms, basic, beautiful, beliving, biceps, bikini, bodybuilding, bone, broken, busy, calorie, clean eating, core, core workouts, determination, estrogen, form, heavy weights, lifting, testosterone, toned, weights and tagged Breakfast, clean eating, dinner, dreams, Eating, fat, fitness, health, healthy, Home, on the go, Physical exercise, protein, quick, weight, Weight loss, Workout. Bookmark the permalink.